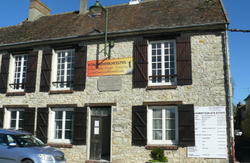 Hostel near Fontainebleau; easy access to legendary bouldering areas (between Larchant and 3 Pignons). Also a small camping. 6â‚¬ compulsory linen rental (at check-in), once per stay. Highway A6 (heading South-East of Paris), pass toll station (take ticket), exit Ury (pay the toll), turn right after toll, direction La Chapelle La Reine (first village, 3 km/2 miles). second traffic light on the right: Place de la RÃ©publique (center of town), park here; the hostel is beside 'CrÃ©dit Agricole' bank.